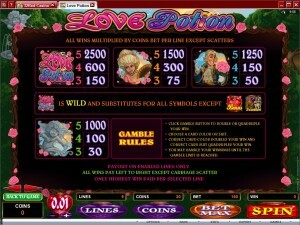 A Microgaming title, Love Potion is a very romantic looking slot machine, with beautiful graphics and with just the right amount of pink flowers in it. The action seems to take place at the court of a king a few hundred years ago, the aristocrats with wigs being a good clue regarding the time period. You will find out yourself how good the slot looks if you give it a chance, and it’s original enough with its theme that I believe you’re going to enjoy it even if you’re bored with most slots released these days. 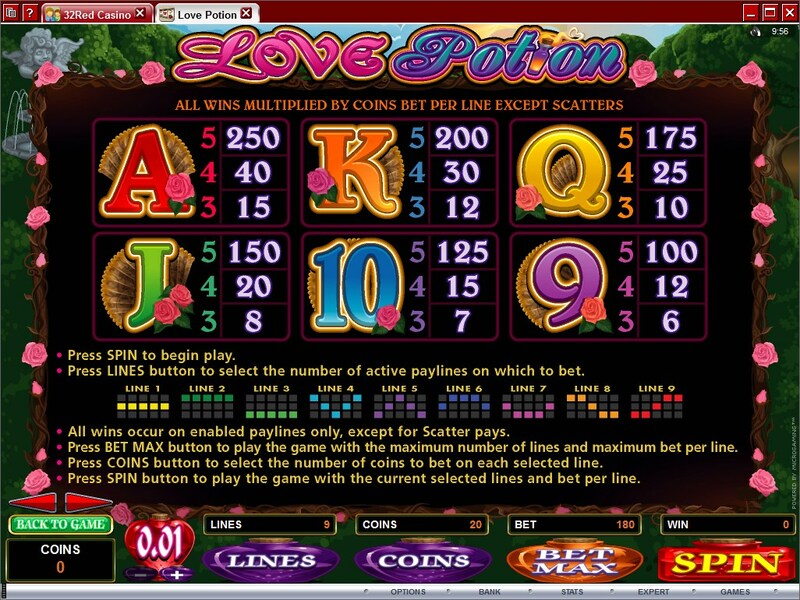 Despite its gorgeous graphics, which are often found in slots with a lot of paylines, Love Potion has only 9 paylines on its 5 reels. 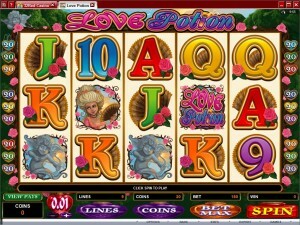 It has a bonus game, a round of free spins, 5x multipliers and a wild. $12,500 is the maximum value of the top jackpot. The features of Love Potion include a wild symbol, a bonus symbol and a scatter. The first one gives you its substitution ability and the top jackpot, while the second one brings a bonus game and the third one has free spins for you. The wild is the easiest one of the three to explain, so I’ll start with it. It’s the only symbol in this game that is capable of taking the place of another in a new combination. The substitution occurs only when the wild lands in the exact spot where it is needed, with other regular matching symbols also present on that line. It’s also a symbol that can create its own paying combinations, the requirement being for three to five wilds to appear together on a payline, and going from left to right. A wild can’t substitute for a scatter or a bonus symbol. 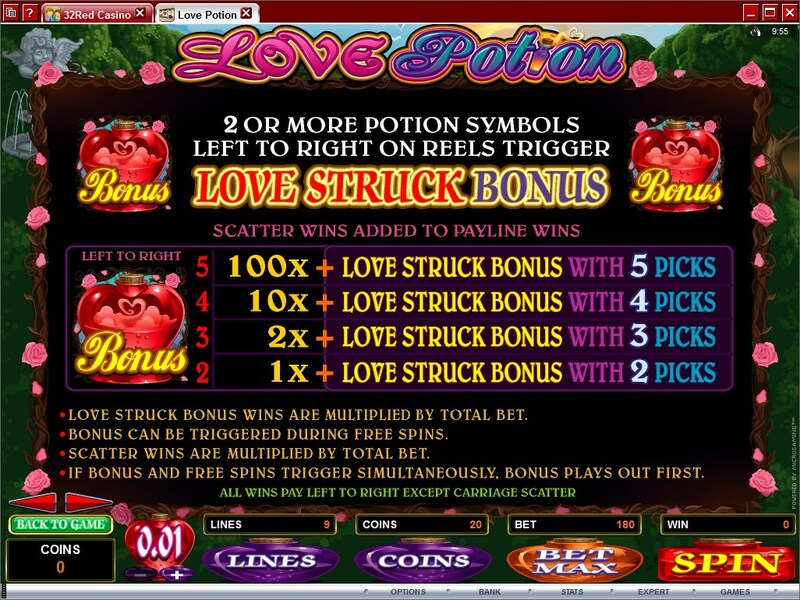 One of the three special symbols to appear in Love Potion, the Carriage is a scatter which is able to give away free spins and multipliers by being present in enough places during the same round. You need a minimum of three Carriages to be present at the same time, and you get in return 10 spins for free and 5x multipliers for all wins. 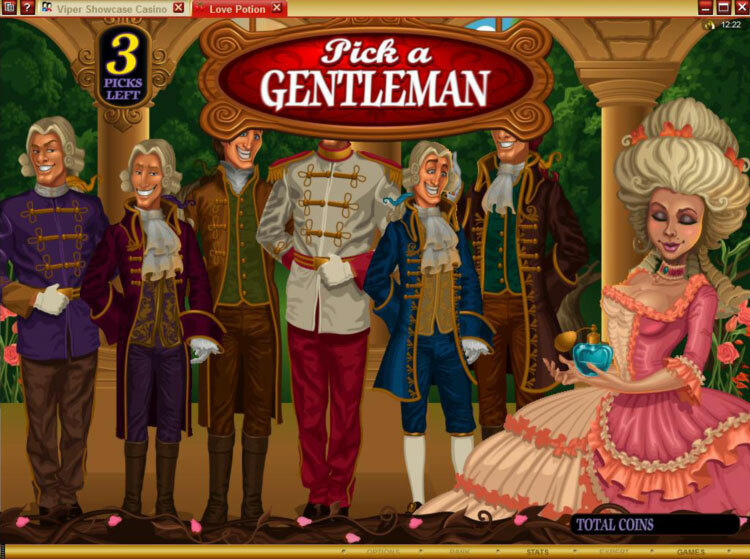 You can also retrigger free spins, as long as you have the required number of scatters present once again. The bonus game is started with the help of its own symbol, and it’s the kind that can appear in scattered positions. Despite its scatter ability, the bonus symbol still has to be arranged on reels going from left to right, but the exact position on them doesn’t matter. A minimum of two Love Potion symbols will be needed in order for the bonus game and a prize to be awarded. Depending on how many bonus symbols are arranged on the five reels, from left to right, you get payouts between 1x and 100x the bet, plus access to the bonus game with 2 to 5 picks to make. Once the bonus game starts, you are taken to a screen with a lady and with six gentlemen that are hoping to be picked. The lady picks two to five of them, and you choose which ones will be selected. Each choice brings you a cash prize. 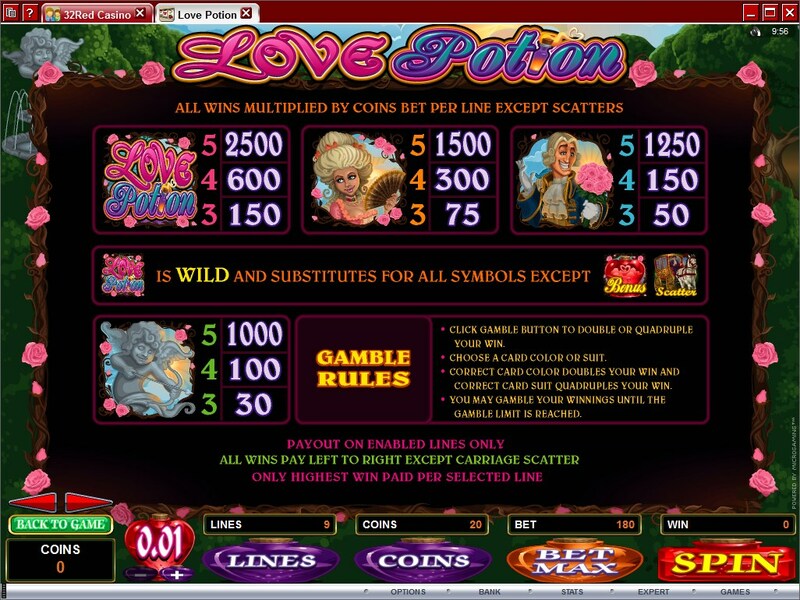 The full betting range of Love Potion is between $0.01 and $45. You can choose up to 9 paylines to activate, and on each one you can place a bet of up to $5. Individual line bets are composed of up to 20 coins, with values reaching $0.25. With the help of the wild, you can get paid up to 2,500 times what you put in on a single line. 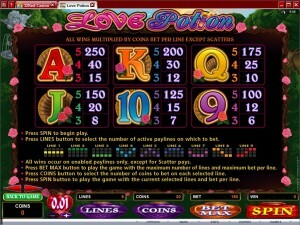 That’s up to $12,500 cash that you can win by playing Love Potion. The design is excellently handled, and the focus seems to be more on the aristocrats that serve as main characters. It looks like the game’s action takes place at a French king’s court, a few hundred years into the past. It’s as elegant a game as you imagine the king’s court to be, and if you ever visited or saw a picture of the Versailles you know what I’m talking about. Even the playing cards have been decorated quite interestingly. Symbols: Logo (2,500x, wild), Love Potion (100x the bet, scatter), Carriage (scatter), Lady (1,500x), Gentleman (1,250x), Eros Statue (1,000x), Ace (250x), King (200x), Queen (175x), Jack (150x), 10 (125x) and 9 (100x). The game’s experience is pretty great, especially thanks to the graphics and the features that are part of it. There aren’t that many lines, so the odds of winning something should be quite low, but the game is still highly enjoyable. 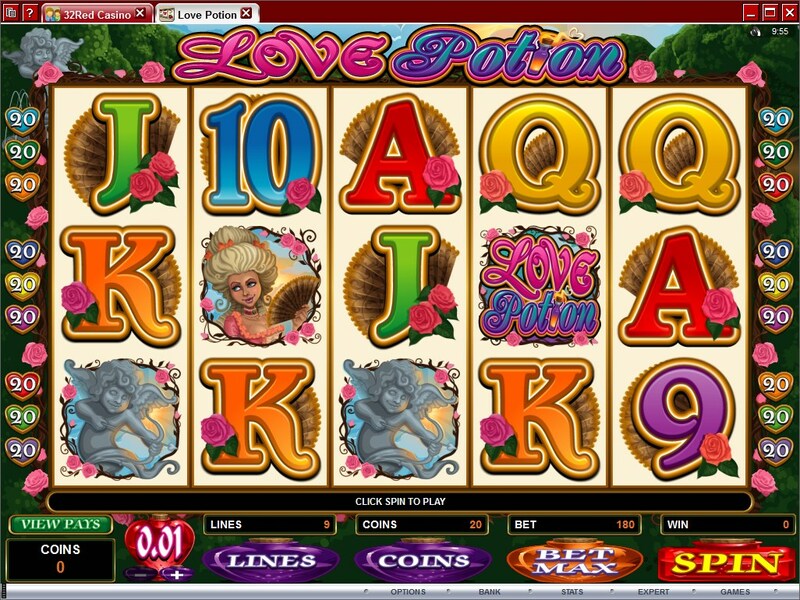 The Love Potion slot machine is offered through the Microgaming platform, so if you want to play it for real or just to practice, look out for casinos that use it.